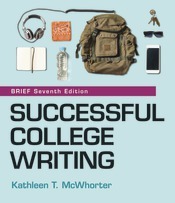 With Kathleen T. McWhorter’s unique visual approach, and more support for reading than any other text of its kind, Successful College Writing moves first-year composition students, whatever their level of preparedness, toward success in college writing. The seventh edition includes even more help for students learning to read critically, including a new "Just-in-Time Guide to Reading and Responding," and new "How Writers Read" boxes in almost every chapter. Newly redesigned based on student input, and in accordance with principles of accessible design, Successful College Writing’s supportive, visual approach is evident in graphic organizers, flowcharts and Guided Writing Assignments that provide hands-on writing activities and practical, step-by-step instruction for drafting and revising. Instructors are supported by an Instructor’s Annotated Edition that includes answers to all the activities; PowerPoint slides outlining the instructional content; an instructor’s resource manual with a section on teaching courses that integrate developmental students into first-year writing classrooms; and an expanded Launchpad full of activities built to enhance the book’s content online, including reading comprehension quizzes, diagnostic quizzes and much more.